The Method feeder is a great way of catching tench – the combination of groundbait and chopped worm is hard to beat, especially with my secret ingredient, Krill powder. Into a bait bowl add three parts of Dynamite Baits’ Swim Stim Green groundbait to one part Krill powder. Mix it up dry to start with. Wet the groundbait slowly until it will stick well to a flat Method feeder. Leave to stand for a while until the water is fully absorbed. Finely chop a handful of dendrobaena worms so that they are reduced to a fine mush, then mix the worms into the groundbait. Use a Quick Stop on a size 12 hair rig to hold a worm in place. The stop can be pushed through the worm, but will then hold it securely. Alternatively, try swapping the worm for an artificial caster on the hair. This will often produce extra bonus tench. I suppose you could say that potato hookbaits really are as cheap as chips! While not suitable as feed, potato can easily be cut into slices and punched to make a tough hookbait. Better still, it takes on colours and flavourings readily, making it a very low-cost, easy-to-use alternative to other hookbaits. Cut a potato into 10mm thick slices using a sharp knife. There is no need to remove the skin. Use a bait punch to produce your plain hookbaits. Punches of 10mm and above work best with this quite tough bait. 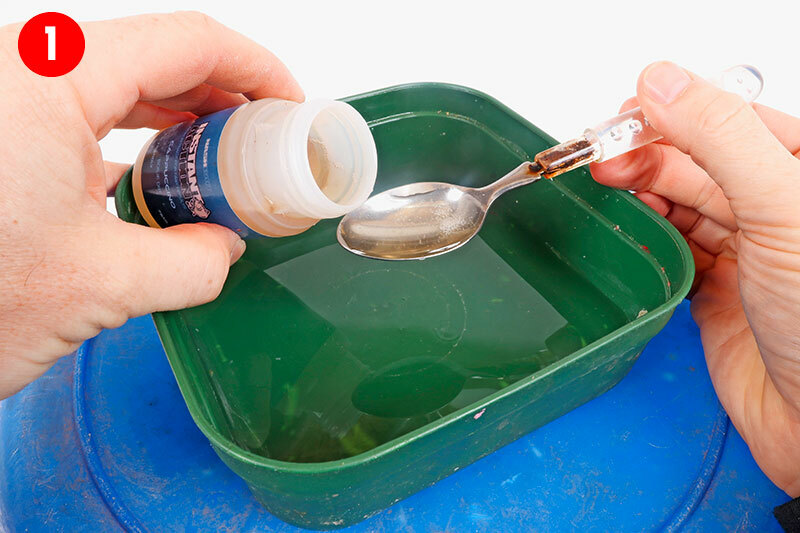 Add a teaspoonful of Strawberry flavouring and half a teaspoonful of red dye, and shake well so that the baits are evenly covered. After a few minutes the potato will have absorbed the colour and flavour. For best results, leave overnight in the fridge. Potato baits are easy to hair-rig and are long-lasting, making them ideal for use with the Method feeder. Micro pellets cannot be prepared in the same way as pellets of a larger diameter, simply by soaking or pumping – try to do that and they will quickly turn to a mush. Instead, you have to add water a little at a time, allowing time for the micros to absorb moisture but never become saturated. You can add liquid flavouring to the mixing water (right) and for an extra ‘kick’ try a teaspoonful of rock salt sprinkled over the prepared pellets. Add a teaspoonful of Cappuccino flavouring to a pint of lake water and mix well. Slowly add some of the water to the micro pellets in a shallow mixing bowl. The pellets should soak up the water immediately. When the pellets start to become tacky, leave them for five minutes so they are able to start absorbing the water. Carefully add a little more water until the pellets are quite tacky but are still absorbing water. Sprinkle a teaspoonful of rock salt over the pellets to give them an extra boost. This is what the finished setup looks like! 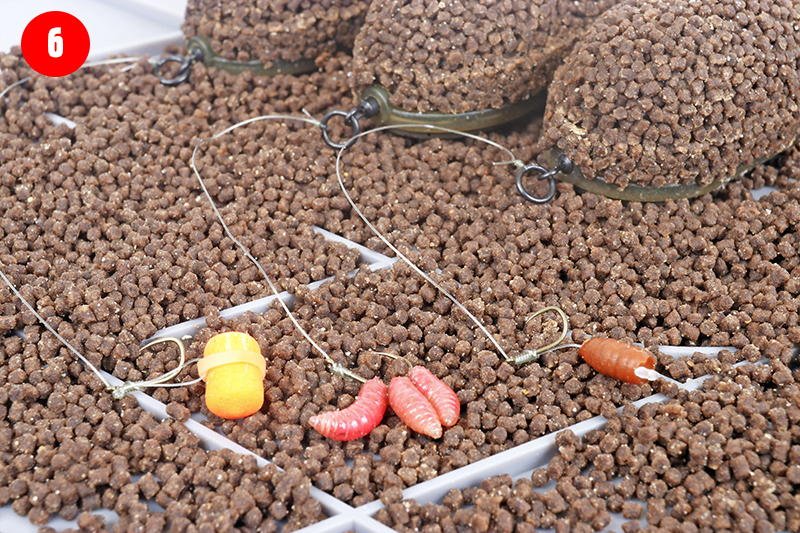 Paul Garner's top tips for colouring your bait! One of the easiest changes you can make to many baits is to alter the colour, but does this really make any difference to catches? I don’t think that fish are attracted to any one colour, but some are definitely more visible than others in different venues, and this can influence our results. On heavily pressured venues, using a colour that is different from the norm can also catch you more fish, especially if you use some of the more obscure hues. What can coarse fish see? Coarse fish have eyes that are not much different from ours. However, they can see some ultraviolet light beyond the blue end of the spectrum that we can see, useful in deep water where most light is at this end of the spectrum. Rather than what colours fish can see, we would be better asking what colours are visible in the murky depths of a river, or the clear water of a lake? Light at the red end of the spectrum is actually absorbed quite quickly. If you go down to 30 feet then even in a gin-clear lake, reds will appear as shades of grey. Most of the time, though, we aren’t fishing in water anything like this deep, so the colours we see are not that different to what the fish will be seeing too. At night colour becomes less important. Even though fish can see quite clearly on even a moonless night, they will see in black and white, with bright colours appearing as lighter shades of grey and dark colours like red appearing almost black. Many baits will take colours easily, and some anglers who have experimented with unusual combinations have enjoyed surprising success until the fish become ‘wised up’ to them. Why not experiment yourself, with simple food colourings? The sky’s the limit! As a general rule, you can make light-coloured baits darker, but you can’t make dark baits lighter. So remember this when colouring your baits. chickpeas, for example, will take red dye easily. Baits that are naturally moist, such as sweetcorn and chickpeas, can be easily coloured using powdered dyes. Chop meat into chunks or cubes and then lightly spray on some liquid dye. After a few hours the meat will absorb it. Groundbaits can be dyed using powdered colours added to the dry ingredients before mixing. Use dark in clear water. Maggots are very difficult to colour at home, so it is best to leave it up to the experts and buy them ready-dyed.